One unit is packed in one gift box. 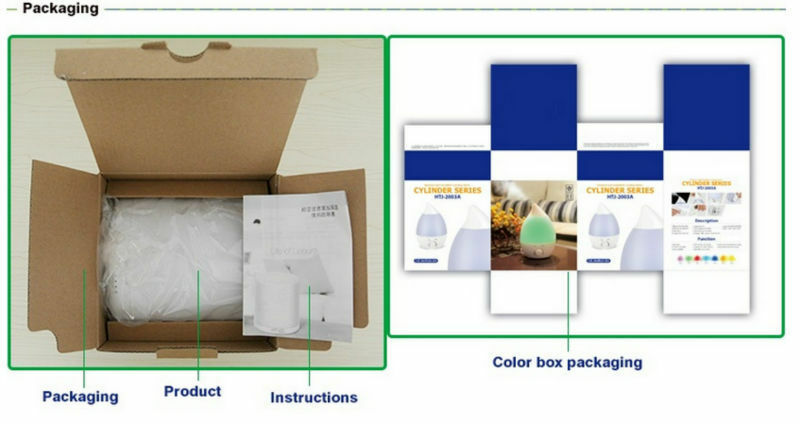 6 pcs are packed in a carton. 1. 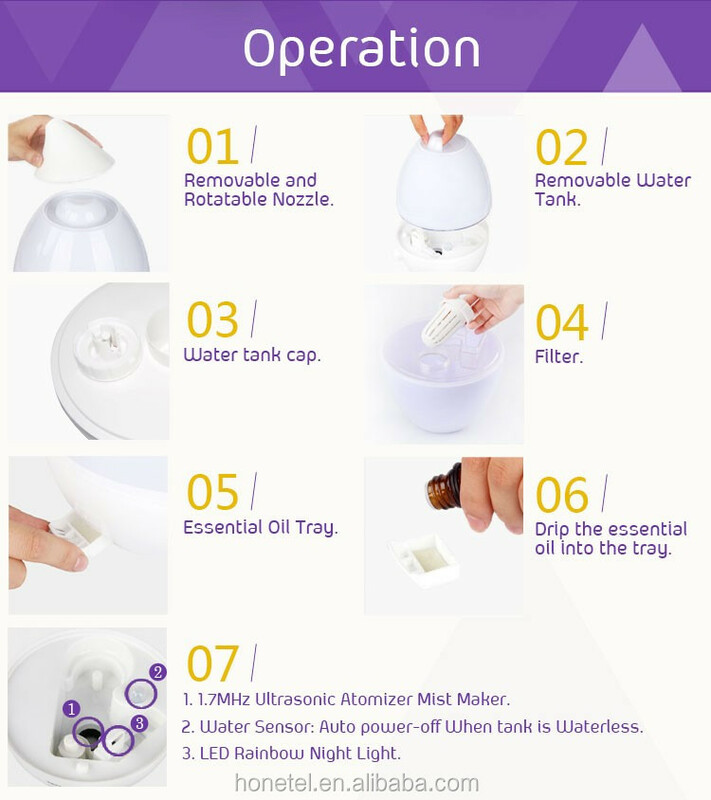 1.7 MHz atomizer ultrasound mist maker humidifier with fresh mist spray. 2. 360° manually rotated nozzle with adjustable mist volume. 3. 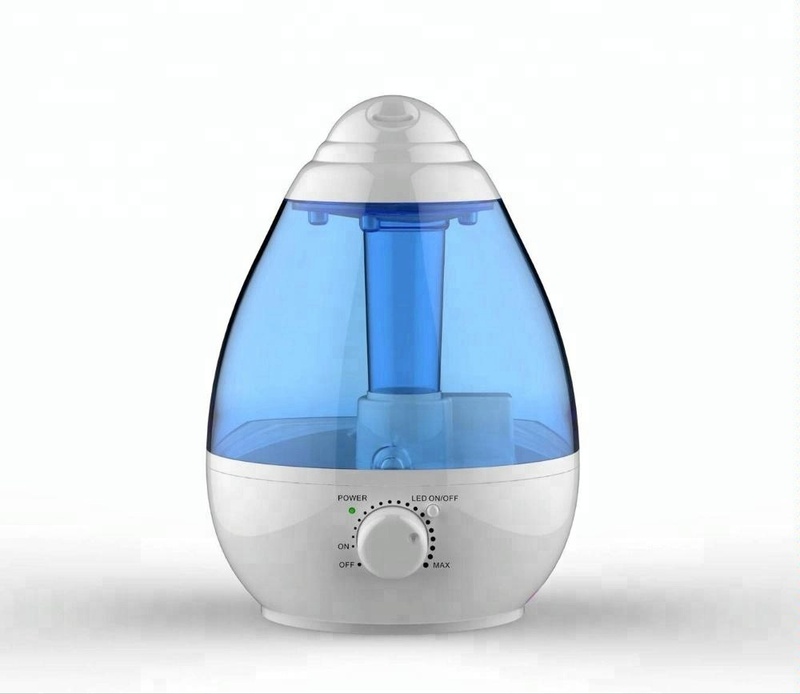 Negative Ions water filtration to spray fresh and clean oxygen. 4. Rainbow night lights with color-changing LED lamp for fantastic looking at night. 5. Portable water tank, easy for refilling, AROMA AVAILABLE. 6. 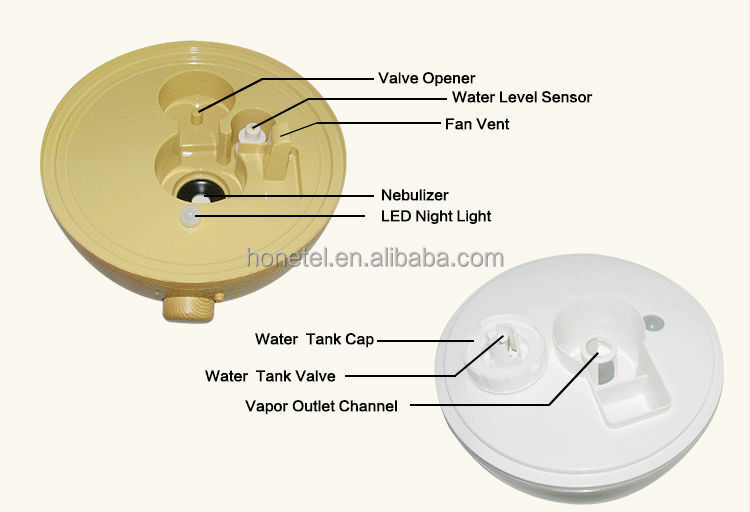 With water alarm safety protection system. 7. Cool mist spray can nourish your skin, purify the air and create a healthyenvironment. 8. Help you release pressure and relieve fatigue. 10. Water filter can be washed and replaced. Applicable for these places: home, office, hotel, bedroom, living room, spa room, yoga room, etc. 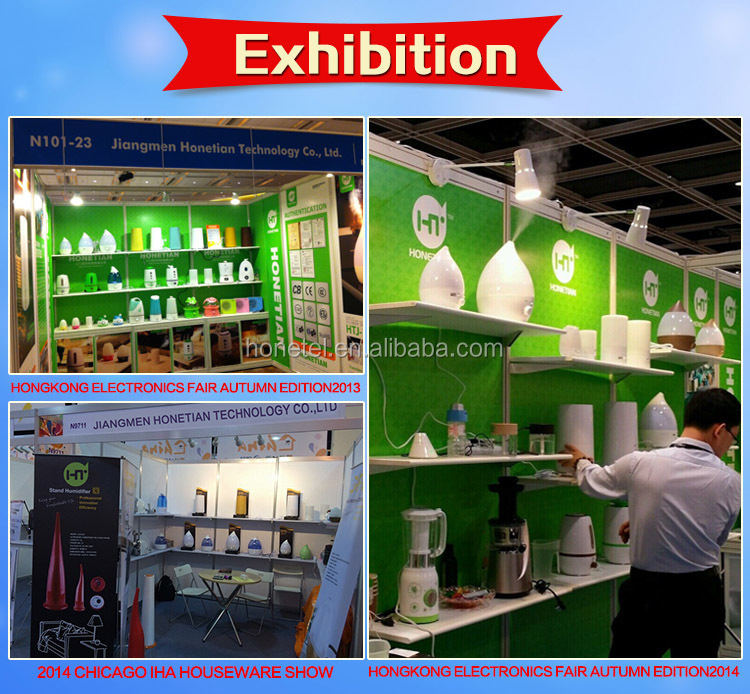 Factory founded in 2003,After more than 15 years development and growth, the company has formed a set of product development, manufacturing and sales in small home appliances area. 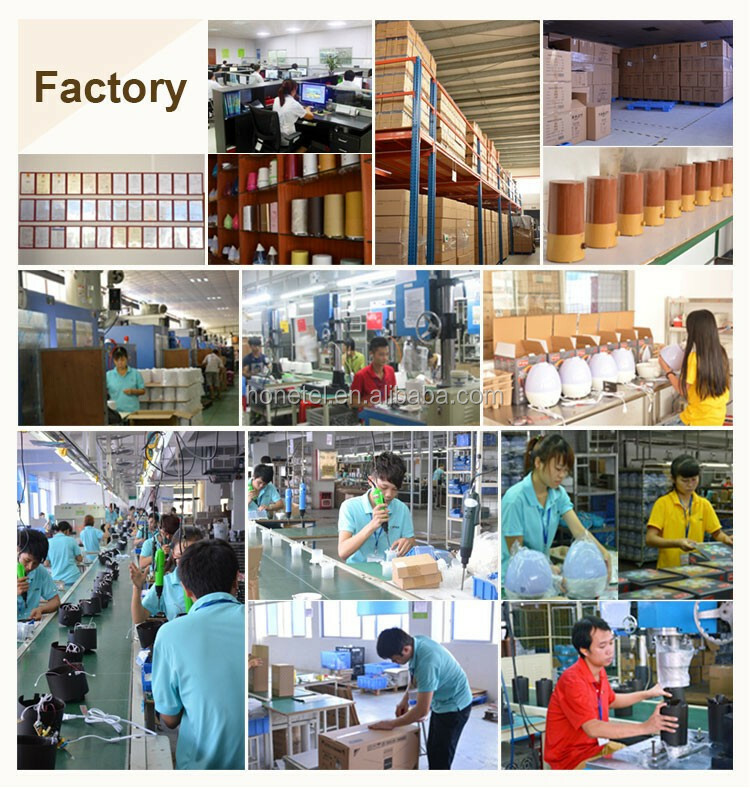 We are a professional area of humidifiers, aroma diffusers, blenders, air circulator fans, with ISO9001 and BSCI. 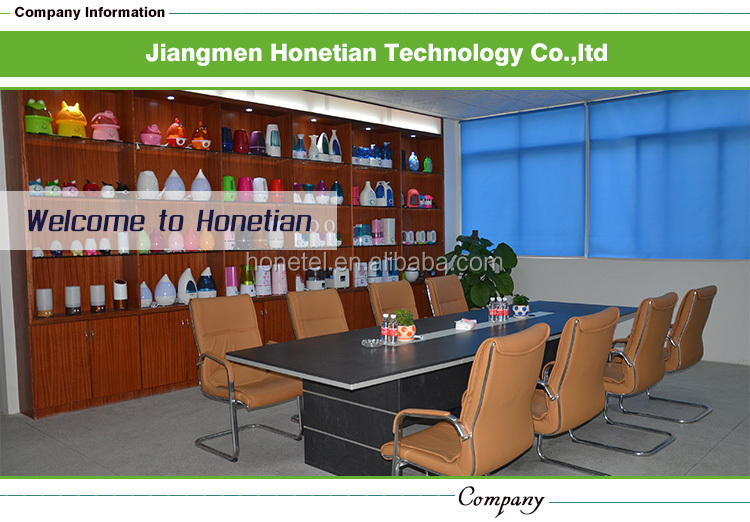 Our factory is located in Jiangmen City, Guangdong Province. 1. Please TURN the humidifier OFF and UNPLUG it before cleaning. 2. Please clean the product every week with SOFT CLOTH. 3. Please DON’T connect the PLUG with the SOCKET all the time. 4. Please KEEP the base and the tank DRY when you DON’T use it. 5. 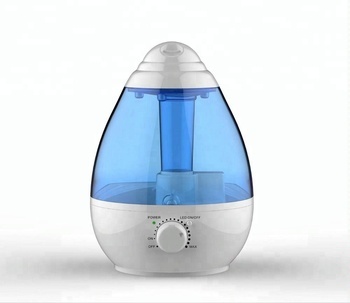 Please use PURE water to clean the humidifier. 6. Please DON’T soak the humidifier under water. 1. All products must be 100% STRICTLY TESTED before packaging. 2. Our warranty for the products is 12 months. 3. 1% of spare parts will be offered for free along with your order. 4. OEM or ODM is acceptable. 5. Both customized color and power are acceptable. 1. Sample can be offered for reference but cost should be paid. 2. The delivery time will be 3~7 days. 3. 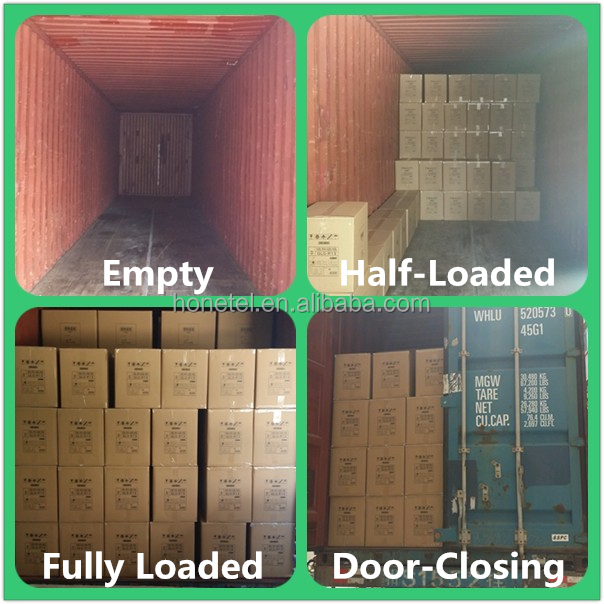 The express companies we cooperate with are FedEx, DHL, UPS, TNT, SF, EMS, etc. 1. FOB is our main trade term, but EXW, CIF and CFR are also available. 2. T/T is the most popular payment term around our customers: 30% deposit in advance, 70% balance against the copy of B/L. Also L/C, PayPal and Western Union are available. 3. Lead Time: normally 30 days, depending on order. 4. Loading Port: Jiangmen, Nansha, Shenzhen. Please feel free to contact customer services.